Uniquely designed to aid in parameter management tasks that are just too complex to be done manually, GAMUT|PARAMETERS can be employed to change specific family parameters, or add parameters to an entire library. GAMUT|PARAMETERS can be used to update, delete and deploy parameters in batches, or export SP files. GAMUT|PARAMETERS also features a unique schema tool, which allows you to assign multiple parameters to entire classes of objects. Add, Remove and Replace parameters in families… Both shared and non-shared parameters can be added, removed or replaced with ease. Project Parameters are added in batch… Include all necessary parameters at one time. Schemas speed the process further… Use criteria (Category, Keynote, etc.) to add different parameters to different families in a batch process. 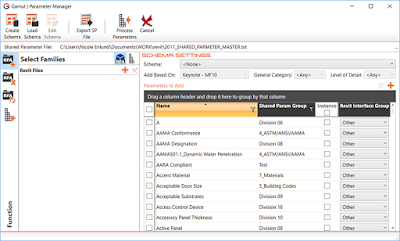 Shared Parameter Files can be exported… Parameters and GUIDs create a Revit Shared Parameter File based on the families selected. GAMUT|PARAMETERS is brought to you by SPECtrumBIM. It's priced at US $15.00/month or $99.00/year. There's more information available on the SPECtrumBIM website.